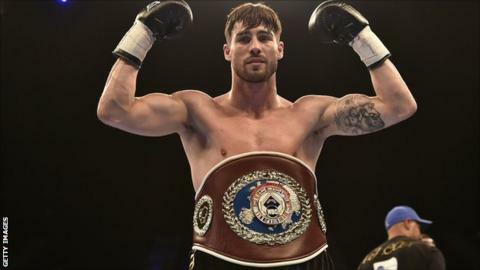 Swindon boxer Jamie Cox has set his sights on a world title fight against Arthur Abraham or Fedor Chudinov. The 29-year-old defends his WBO European super-middleweight belt on Saturday against Ferenc Albert. Cox told BBC Wiltshire: "Hopefully Frank (Warren) can get me a big fight with either Chudinov or Arthur Abraham. "Get this win first and then Frank can concentrate on getting me a world title shot. He promised it. Frank is a man of his word and I know he will deliver." Cox is unbeaten in 19 professional contests and stopped Blas Miguel Martinez in the first round of his last fight back in July. He will meet Hungarian Albert, who has a record of 20 wins and seven defeats, at the National Stadium in Dublin on Saturday. "It is not just about this fight, it is about the future ones, so I am just rolling on and working really hard." Abraham is the reigning WBO world champion, and defends against Martin Murray in Germany on 21 November, while Chudinov holds the WBA version of the title.